Simple set-up and configuration, and stable performance guided the development of the DF-G1. An updated mechanical design, with an improved fiber clamp and a sleek look-and-feel, makes the DF-G1 a compelling upgrade to your existing fiber optic solutions. 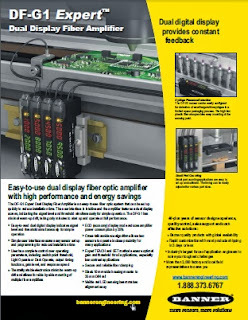 This dual display fiber amplifier expands the range of applications you can tackle with plastic and glass fiber optic assemblies. With IO-Link, the machine builder can achieve point-to-point communication over the last meter of cable when the amplifier is connected to IO-Link to Bus Network adapter. 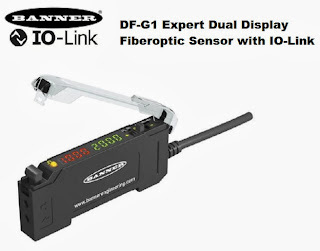 Sensor parameters can be changed, save to and uploaded from a PC using a USB to IO-Link converter and standard DTM (Device Type Manager) files and a FDT (Field Device Tool) container software such as PACTware. This enables storing and documentation of the sensor parameter lists for auditing or replacement of sensors. The second output (white wire / Pin 2) continues to operate at full response speed when communication is occurring over the IO-Link output (black wire / Pin 4) allowing both a high speed response time output and sensor performance logging to occur in simultaneously.